This USB 3.0 thumb drive rivals Samsung's T1 in read speed, but writes barely faster than a hard drive. USB flash drives have become the almost universal method of sneakernetting small amounts of data. Small by today’s standards, anyway. However, it’s getting to the point where these thumb drives can take on the larger data sets that had, until now, been the province of portable hard drives. Witness Visiontek’s USB 3.0 Pocket SSD. Little larger physically than the average flash drive, it starts at 128GB capacity and maxes out at a substantial 512GB. There's also no surtax for the higher capacities, as there has often been in the USB thumb drive market. 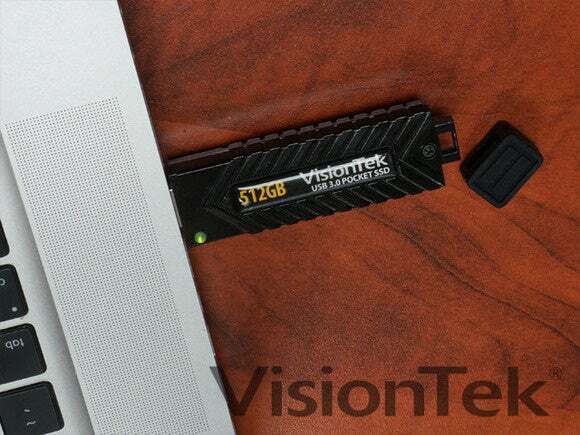 The Visiontek Pocket SSD is actually a bit pricier per gigabyte in its lower capacities, though all can be had for between 30 and 40 cents per GB if you shop around. 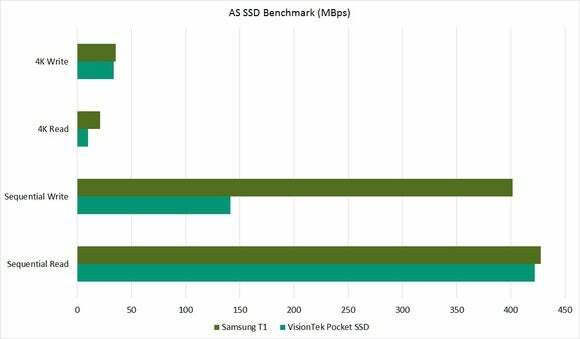 The 512GB Pocket SSD is a very fast reader for a USB 3.0 mass storage device, topping out at about 420MBps in AS SSD—nearly as fast as Samsung’s T1 USB 3.0 SSD. Alas, it’s only half the writer the T1 is, managing a hard drive-like 140MBps compared to the Samsung drive’s 310MBps. Random access times are quite quick, as they should be with anything NAND-based. According to VisionTek, the NAND is MLC in this case, and shouldn't suffer any write drop-offs like TLC. Then again, TLC generally performs at about 140MBps when writing. Just saying. 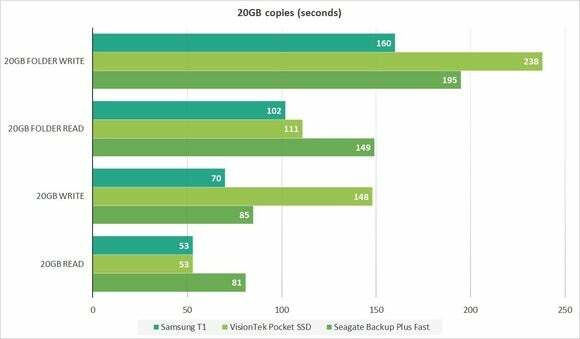 While a very good reader, the Pocket SSD was actually outperformed in sustained writes by a Seagate Backup Plus Fast USB 3.0 hard drive (using RAID 0). While the VisionTek Pocket SSD matched up well with the Samsung T1 reading, and even when writing our 20GB set of small files and folders, it was distinctly overmatched when it came to writing our single 20GB archive. 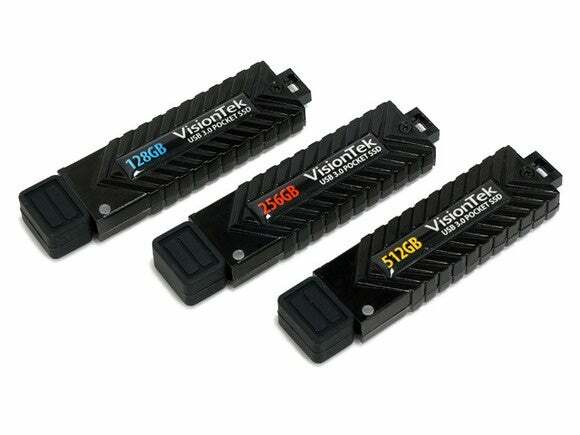 I quite like the convenience of the Visiontek USB 3.0 Pocket Drive as well as its read performance. But as affordable as it is, I wish it were a bit cheaper. Why? Because when I perused Amazon, the 512GB version of the Samsung T1 was available for $150, while the same-capacity Pocket SSD cost $180. It should go without saying that a faster drive for less money is the more attractive purchase. I’m guessing that with the release of Samsung’s metal-jacketed T3, which is to be available in up to 2TB capacities, the price of the T1 might dip even a bit further. Also, the Samsung T1, while a different form factor, actually feels a bit lighter and fits in most pockets as easily as a thumb drive. In many cases, more comfortably. That said, I like a little heft in my thumb drives as it makes them a tad easier to locate in my pocket- and compartment-mad backpack. I'd also bet on the Pocket SSD surviving heavy abuse better than the T1. Unlike with the Samsung T1, there's no cable to carry or lose. The Visiontek USB 3.0 Pocket SSD is self-contained (no cable to lose as with the Samsung T1), affordable, and a very fast reader. It also shed heat quite well in my testing and has a nice heft to it. Nothing to dislike there. If the thumb drive is your preferred form factor, go for it. But only for distributing data. If backup is your goal, then a hard drive is nearly as fast and a lot more affordable. If money is no object, the Samsung T1 or T3 are better USB 3.0 SSDs for backup.